Are you tired of the same old fitness routine? Are your muscles hurting from heavy weights or due to running? We think it’s about time you jazzed up your fitness routine by trying yoga. This form of meditation and exercise has been around for thousands of years and its health benefits have been touted by many yoga practitioners. If you’re new to yoga, here are some of the health benefits you will experience. As we age our bodies naturally lose flexibility, making us more prone to injuries. One way to reverse this is by practicing yoga. 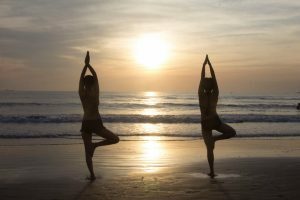 Websites like YogaBody.com is a site that offer online courses so that you can practice yoga without leaving the comfort of your home. There are different types of equipment available online such as the trapeze, which can improve muscle elasticity and strengthen the core. Flexibility is not genetic so it needs to be developed. Products like the Flexibility Kit can help you gain up to 50% flexibility for a better range of motion and can help athletes reduce their risk of injury. Yoga can also help people who find themselves out of breath all the time. Yoga encourages mindful breathing that can help improve lung capacity and boost endurance. This can be very beneficial to runners as it will help them increase their athletic performance. Check out courses specifically for runners to improve breathing and endurance. If you find yourself with back pain due to poor posture, yoga can help you correct slouching. YogaBody.com has a program for the back and neck that can help alleviate pain in this area. It is a 5-week training program that targets these specific areas of the body while helping you to sit and stand properly to improve posture. Access videos on Yoga Trapeze for better traction on the spine while building upper body strength for better upper body muscle tone and better posture whether your’re sitting down or standing up. Stress is normal in today’s fast-paced life but practicing yoga is a good way to get rid of it. There are styles of yoga that use meditation techniques that can help calm the mind; which is actually the main cause of stress and anxiety. Deep breathing also forces you to focus on your breath and can bring a much-needed calmness in your life. Products like the Essential Mister from the YogaBody shop can help reduce stress through aromatherapy. During meditation, you can plug in the mister and load it with essential oils like lavender that is known to be a calming agent and also helps to promote better sleep. Regular yoga sessions are proven to improve your heart health. Since yoga helps to reduce stress and anxiety, it can also help lower blood pressure. Studies show that yoga helps to regulate heart rate and lower risk of heart disease. Access recipes online to help you boost heart health and lose weight. YogaBody supports vegan diet which is known to reduce your risk of heart disease by decreasing plaque buidup in the arteries. YogaBody caters to beginners and advanced yogis alike. Aside from yoga poses, you can also find equipment like gymnastic rings, trapeze and handstand blocks that can help you take yoga to the next level and prevent it from becoming repetitive or boring. YogaBody has a range of products, supplements and equipment that can help you practice yoga and transition to a healthier and better life. YogaBody – Double Your Flexibility In Weeks. Nutrients For Yoga Enthusiasts!